The cricket season is pretty much over and winter will soon to be sending a nasty chill around your nether regions. That means no more staggering through Regents Park, pint in hand, watching the cricket, dressed in shorts and not much else until the beginning of August 2006 at least, and that's assuming we survive the World Cup with our livers intact. So Londonist was heartened to see the London College of Fashion had joined forces with University of Bath to jointly research biomimetic clothing. Well let's just say it might just get you to the pub dry and not too sweaty. You see biomimetic clothing is one of those advanced materials that uses the latest in "micro technology" allowing in air to cool you when it's hot, and shut out air when it's cold. When the wearer gets hot and sweaty the tiny spikes in the material react to the moisture and automatically open up so that air from the outside can get through the material and cool you down. When you stop sweating, the diminutive spikes will close down again to stop air from getting in. It's a bit like having your own little personal Porcupine skin. 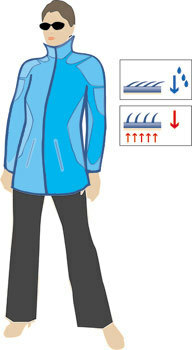 The lower layer is also water-resistant, keeping rain and spilt pints out whether the spikes are either open or closed. It seems to us to be the perfect sort of garb for those wintery treks, up hill to the local in the pouring rain. Now all they have to is come up with some cool designs and give it a name we can pronounce (and maybe some real life models). As a sidenote, the London School of Fashion and the University of Bath joint project has been chosen as one of eight to represent United Kingdom science at Expo 2005 in Japan from March to September next year.